I haven’t had the greatest luck in terms of timing for most of my visits in North America. This has been mostly due to vintage, but in some cases due to the big Wine Spectator tasting in NYC. The bad luck I experienced in the Niagara Peninsula on this particular Saturday was due to a promotion they have running every weekend in November, which is essentially a passport weekend. You buy a ticket and enjoy a bit of food and wine at as many wineries you can visit in one weekend. There were considerably more people in the region than normal, so I was contending with crowds. This was especially apparent in Niagara-on-the-Lake, closer to Niagara Falls with larger wineries closer together. Niagara-on-the-Lake is also very flat, which in my opinion doesn’t make for great wines, but is easier to drive around I guess. 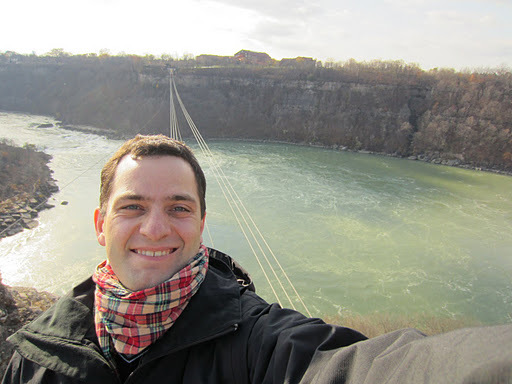 Below is a photo I took above the Niagara Whirlpool. Whilst Chateau des Charmes is one of the larger wineries on the Peninsula, it is still family owned and has been for over 30 years. The winery was established by a French Algerian who pioneered grafting European vinifera vines onto native North American rootstocks to help them survive the harsh winters, which can drop down to -30 degrees. The viticultural aspects of Chateau des Charmes are exceptional, using various trellising techniques and sustainable practices. The visitor centre is in the chateau on the estate, and is one of the best I’ve seen. They have various areas for retail and tasting, on two levels. They also offer tours on the half hour in summer, which starts in the vineyard and goes down into the cellars. 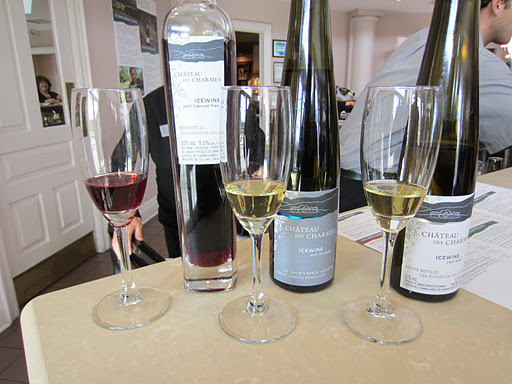 The winery is best known for its ice wines, which were exceptional but should be at $75 for 200 ml. They produce the only savagnin ice wine in the region (possibly the world), which was very grassy for a dessert wine, but had a very concentrated citrus based mid-palate. One of the more interesting estates I have visited was Coyote’s Run, which has two distinct soil types for each vineyard. 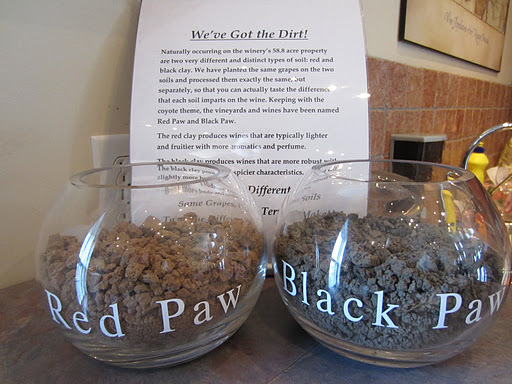 The Red Paw vineyard has what they call red Trafalgar clay loam, and the Black Paw vineyard has a dark Toledo clay loam. They promote the nature of terroir using numerous wines made from these two vineyards, and there is a significant difference between them. The issue I had with the wines was that they were either very light and devoid of character, or they were poorly made. These wines seemed to be suffering from their climate, as they lacked ripeness of fruit and tannin. 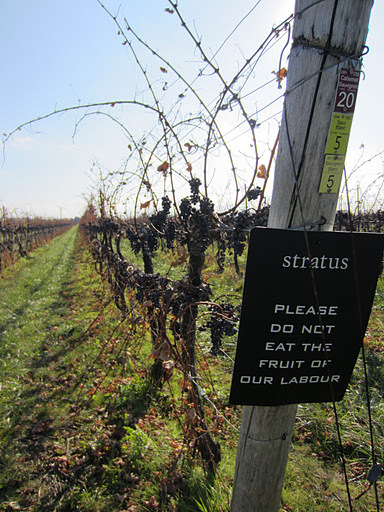 Stratus Vineyards, established in 2000, is making a name for itself as a sustainable and innovative winery that makes blending a focus. The facility itself is quite breathtakingly modern, and is a gravity-flow based energy-efficient winery. Amazingly the vines still had fruit on them, despite the shoots caning over and losing all of their leaves. A French winemaker uses up to 18 red and white varieties to blend the flagship wines, and depending on the vintage makes single varietal wines. It was fantastic to do a vertical tasting of the Stratus White and Red wines from the 2006, 2007 and 2008 vintages. The 2006 and 2008 vintages were very similar, so tasting the 2006 was like seeing where the 2008 will be in a few years. The 2008s were showing their youth, and not expressing a lot of fruit, but had great balance. The 2007 vintage was warmer, so the fruit for both wines was full and rich, and will develop faster in the bottle. In terms of the Stratus White, the 2006 was showing the best, picking up a oiliness and roundness from bottle age. The 2007 Stratus Red was the best now, as the 2006 was closed in the bottle and the 2008 was far too young. A similar approach is taken to the Ice Wines, as they release a white and red blend. Another Frenchman makes the wines at 13th Street Winery, now located on 4th Avenue. 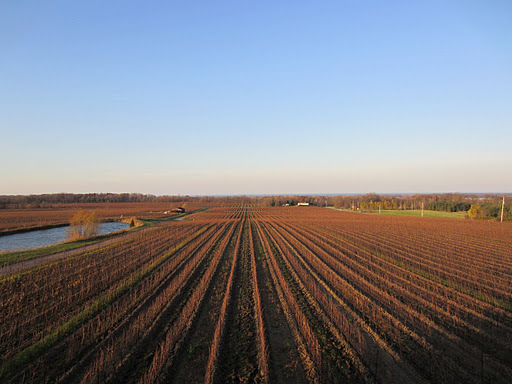 A wide range of wines are made using fruit from numerous vineyards from within the Niagara Peninsula. 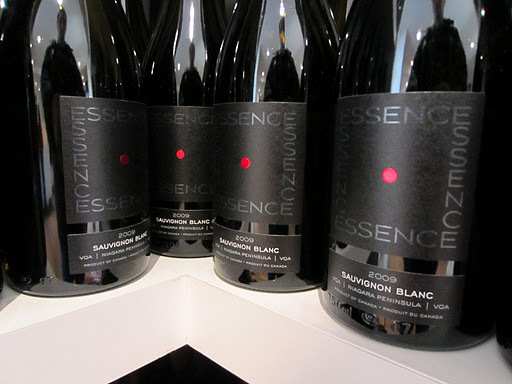 The rieslings had a great richness and acidity balance, with an unmistakable crude oil and kerosene character. The rose made from cabernet franc, quite dark in colour, had a fascinating beetroot nuttiness with a wash-rind cheese note on the nose. The pinot was quite good for the region, but was showing very young. The cabernet franc table wine was very good, with structure and tannins, and great aromatics. I heartily suggest giving 13th Street a visit if you are in the area, as they also have a fantastic bakery and market. Not unlike Fielding Estates, the Flat Rock Cellars Tasting Room is located on a ridge above their vineyards, and has a fantastic view. A Kiwi makes the wines here, but I didn’t hold it against them. As you can imagine, they make a sauvignon blanc, which I found to be unmistakably made by a Kiwi, with obvious differences to an actual Kiwi SB. Another noticeable Kiwi influence can be found in the packaging of the wines, as they are all sealed under screw-cap. He also has a serious pedigree at Felton Road in Central Otago, so understandably pinot noir is a focus at Flat Rock. The 2009 Estate Pinot Noir has lovely soft and mellow tannins, like a Marlborough PN, and a good introduction to the variety. The 2009 Gravity Pinot Noir on the other hand has immense balance of fruit and savoury elements, great length and a gamey undercurrent. Thanks for the nice comments about our winery (Chateau des Charmes). But please allow me to correct a couple of incorrect facts: our Icewines range in price with our 200 ml Vidal $25.95 and the Savagnin & Cabernet Franc $75 for 375 ml, not 200 ml as you mention. Also, the grafting of vitas vinifera to North American root stocks has nothing to do with winter hardiness. It's a practice done all over the world, except Chile, due to phyloxera. What my father-in-law did pioneer, among other things, was the exclusive use of vitis vinifera in a comercial vineyard & the estate winery model. I hope the next time you visit we will have the opportunity to meet. Perhaps I can take you behind the scenes to show you a little more of what we do.Safe travels! Hi MLB,Thanks so much for taking the time to read my blog and make comments, as you can imagine I am always concerned about errors or miscommunications. With regards to the reasons for grafting I completely understand the need to protect vitis viniefera from phylloxera, however this was not the reason provided as part of the tour. There are actually large areas in Australia which still remain ungrafted and have had to instances of phylloxera. In terms of the sizes of the bottles, my fault entirely for not double checking. I hope that I can visit the Niagara Peninsula again, and would love to take the opportunity to meet yourself at Chateau des Charmes.Best regards,James.